As historian Kenn Harper has noted on many occasions, the strong bonds of friendship that tied Charles Francis Hall’s Inuit guides and translators, Ebierbing (“Joe”) and Tookoolito (“Hannah”) together were extraordinary. As Joe himself put it, several years after Hall’s death, "never be such a good man as Hall again - never so good to me." And yet, as with any friendship, there were a few rough patches. One of the rougher of these was doubtless the time when, though King William Island lay in reach, Joe and other Inuit refused to take Hall there, as they were worried about persistent accounts of a hostile Inuit band, the "See-neem-e-utes," whose territory lay between them and their goal. 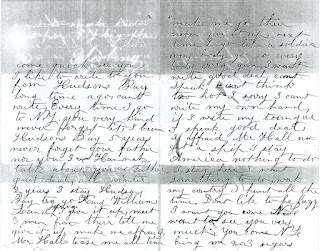 Up until recently, we’ve had only Hall’s account of the affair, but a few years ago in the Hall papers at the Smithsonian, I stumbled upon a document that turned out to be a letter — the only one known — written (or rather dictated) by Joe to Henry L. Brevoort, the son of one of Hall’s key supporters. It’s a fascinating document, and touches on many subjects, including Joe and Hannah’s daughter (“Punny go to school every day”), daily life in the home established for them by Sidney O. Budington (“the old man is good friend”), and Joe’s request for some New York cigars, which he declares are the best. 2 years I stay Houdsons Bay try go King William Land then I give it up, meet 3 men from their tell me give it up make me afraid. Mr. Hall tease me all time make me go their never give it up. Next time I go like a soldier every body go so every body carry gun. It's easy to imagine Hall, whose bursts of anger when the Inuit on whom he relied were reluctant to follow his dictates were well-known, being furious at this delay. It seems, though, that whatever rift this may have caused must have eventually healed. 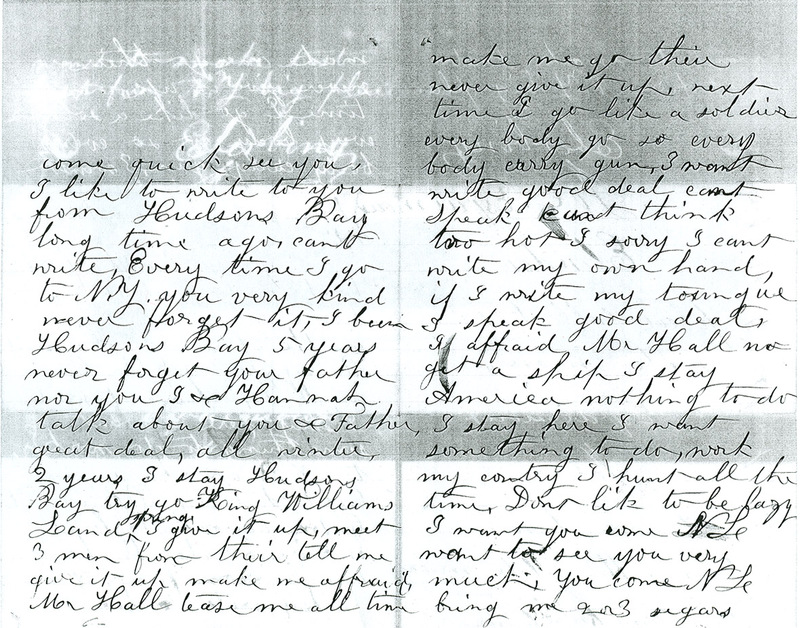 Joe's letter closes with a poignant and somewhat puzzling series of phrases: "Ebierbing. Joe. Esquimaux. Elonder. Pleas call haff wite man no Esquimaux Joe." Clearly, he did not like the sobriquet "Eskimo Joe," a name that has persisted in popular culture (and as the name of a popular restaurant in Oklahoma), but "Elonder" is a puzzle. His request to "pleas call haff wite man" may similarly reflect a desire to not to be seen as some cultural outsider, rather than as any actual comment on his ancestry. "THINK of Christmas in the tremendous wastes of ice and snow, that lie in the remotest regions of the earth ! Christmas, in the interminable white desert of the Polar sea ! Yet it has been kept in those awful solitudes, cheerfully, by Englishmen. Where crashing mountains of ice, heaped up together, have made a chaos round their ships, which in a moment might have ground them to dust; where hair has frozen on the face; where blankets have stiffened upon the bodies of men lying asleep, closely housed by huge fires, and plasters have turned to ice upon the wounds of others accidentally hurt; where the ships have been undistinguishable from the environing ice, and have resembled themselves far less than the surrounding masses have resembled monstrous piles of architecture which could not possibly be there, or anywhere; where the winter animals and birds are white, as if they too were born of the desolate snow and frost; there Englishmen have read the prayers of Christmas Day, and have drunk to friends at home, and sung home songs." 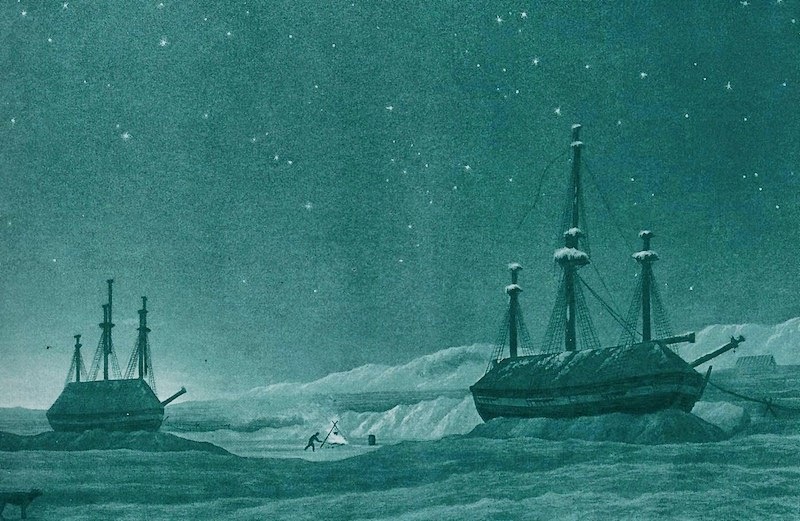 "In 1819, Captain Parry and his brave companions did so ; and the officers having dined off a piece of fresh beef, nine months old, preserved by the intense climate, joined the men in acting plays, with the thermometer below zero, on the stage. In 1825, Captain Franklin's party kept Christmas Day in their hut with snap-dragon and a dance, among a merry party of Englishmen, Highlanders, Canadians, Esquimaux, Chipewyans, Dog- Ribs, Hare Indians, and Cree women and children. In 1850, some commemoration of Christmas may perhaps take place in the Frozen Regions. Heaven grant it! It is not beyond hope ! and be held by the later crews of those same ships ; for they are the very same that have so long been missing, and that are painfully connected in the public mind with FRANKLIN’S name." You can read McCormick’s account in full here. Of course, much of the resonance of his story is how it shows the explorers keeping the traditions of home, evoking an elaborate Victorian Christmas even in the most desolate regions of the world. On this occasion, the ship was redecorated as a "hotel," and the drinks were kept cold by being served atop an enormous block of solid ice. McCormack, oddly, says very little about the food, but other explorers were far more voluble; you can follow the links here to read of a feast of "Banks Land Reindeer" in "Christmas-Keeping in the Arctic Regions, 1850-51," relish Elisha Kent Kane's Christmas on the Second Grinnell expedition, at which mere "pork and beans" were disguised as all manner of delicacies by the men's scurvy-fed imaginations, or devour A.W. Greely's luxurious first Christmas with the Lady Franklin Bay Expedition at Fort Conger, which featured mock-turtle soup, salmon, tenderloin of musk-ox, plum pudding with wine sauce, dates, figs, cherries, egg-nog, and an extra ration of rum -- a sad contrast with the meals of the last few survivors three years later, who endeavored to support life by fishing for brine-shrimp through a sieve. Wherever readers of this blog may find themselves this Christmas, I hope that your evening meal is enriched by all the warmth and spirit of domestic tranquility that these men's meals -- whether in reality, or in their imaginations, or both -- sought to evoke so far away from home. 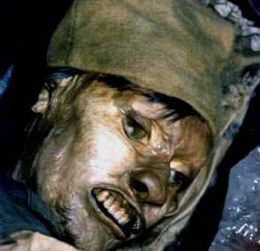 The question of whether there may or may not be human remains aboard either HMS "Erebus" or "Terror" is haunted by the long shadow of a story that was passed through Inuit oral tradition for many decades: the story of the man with the "long teeth" whose body was found on board the ship at Utjulik. A version of this story, with many of the same essential points, was told to Franklin searchers from McClintock in 1859 onwards. 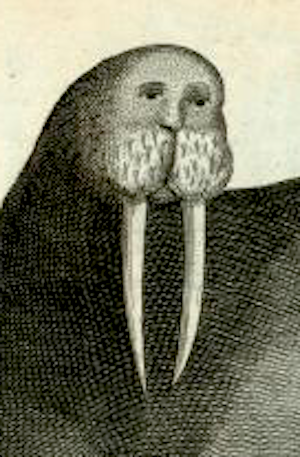 At one point, Franklin theorist Noel Wright theorized that perhaps HMS Investigator had drifted south, and that its figurehead, said to resemble a walrus, might have been mistaken for a man with long teeth by the Inuit! This of course, ignores two vital details: 1) The Inuit knew quite well how to tell a carved walrus from a dead man; and 2) figureheads don't "smell very bad," another key part of the story. And of course, we now know what he didn't: that HMS Investigator never moved from her final resting place in Mercy Bay. But let's look at this story, with all its variants, across time. The version told to McClintock was second-hand, and provided by a young man whom they interviwed alongside old Oo-na-lee, a Netsilik elder then camped near Cape Victoria: "The [young man] also told us that the body of a man was found on board the ship [at "Oot-loo-lik]; that he must have been a very large man, and had long teeth; this is all he recollected having been told, for he was quite a child at the time." "The party on getting aboard tried to find out if any one was there, and not seeing or hearing any one, began ransacking the ship. To get into the igloo (cabin), they knocked a hole through because it was locked. They found there a dead man, whose body was very large and heavy, his teeth very long. It took five men to lift this giant kob-lu-na. He was left where they found him." "She says that Nuk-kee-the-uk & other Ook-joo-lik Innuits were out sealing when they saw a large ship - all very much afraid but Nuk-keeche-uk who went to the vessel while the others went to their Ig-loo. Nuk-kee-che-uk looked all around and saw nobody & finally Lik-lee-poonik-kee-look-oo-loo (stole a very little or few things) & then made for the Ig-loos. Then all the Innuits went to the ship & stole a good deal - broke into a place that was fastened up & there found a very large white man who was dead, very tall man. There was flesh about this dead man, that is, his remains quite perfect - it took 5 men to lift him. The place smelt very bad. His clothes all on. Found dead on the floor - not in a sleeping place or berth." Finally, when during Schawatka's search a decade later, Puh-too-raq told of the ship he had personally visited, aboard which there was a "dead body in a bunk inside the ship in a back part." Both Gilder and Klutschak confirm that his story included mentioning "a dead man in a bunk," though none of their, or Schwatka's accounts include the detail of the teeth. Rasmussen heard from the grandchildren of some of these same witnesses, and they too spoke of bodies -- this time in the plural -- "lying in their beds" (presumably bunks or hammocks). John Hartnell -- a man with long teeth! The best explanation for this tradition of stories is that there was at least one body on board the ship at Utjulik. The points of general agreement are that it was in the "back part" (stern) of the ship, in a room that may have been fastened (locked) or nailed shut, and that it was a large, heavy, tall man. That he would have seemed tall to the Inuit who, historically, were a foot or more shorter in statue that the average European at the time, is not surprising; that he was "heavy" and that his remains were "quite perfect" suggests that he died aboard, quite possibly where he was found. The "long teeth" are doubtless due to the desciccation of the lips and gums, which has in known cases made the teeth appear much longer than they would in life -- see for example John Hartnell (right). I would be willing to bet that these remains, which sank with the ship in question before the next summer, are still on the site. The ship must be HMS "Erebus," so if the body was in fact in the stern, it might well have been in the captain's or "great" cabin. By the same token, since portions of that area of the ship have been torn away and lie below the vessel, the most likely place for these remains might be in the débris field at the stern.